Is well-cooked pasta the same as pasta that is cooked well? The elusive ‘al dente’ condition is a description relating to the firmness (or texture) of cooked pasta, but how sticky the product is also has a critical influence on the consumer’s perception of the perfect serving. Traditionally, a technician simply pinched a sample piece between their fingers to make a subjective decision. Despite being highly-trained, the method results in variation so an objective way of measuring the stickiness is needed. A food texture analyzer provides a repeatable test in order to better understand the effect of processing and cooking times on the quality of the product. To demonstrate this, a Food Technology Corporation (FTC) TMS-Pro Texture Analyzer was fitted with a 500 N intelligent loadcell and a 75mm diameter compression plate. Overcooking pasta produces a product that is stickier, because it allows more time for starch to be released. 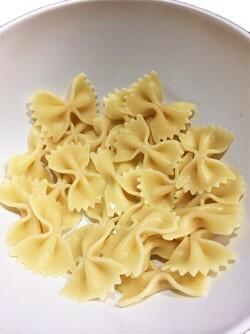 For the control batch, a serving of farfalle (or bowtie) pasta was cooked according to the supplier’s recommended instructions of 12-14 minutes in boiling water to achieve the ‘al dente’ texture. The overcooked sample remained in the water for 18 minutes. The batch of cooked pasta was rinsed briefly in a colander to cool, then an individual piece removed and immediately tested. For each test, the sample was placed on the lower table and the TL-Pro test program moved the compression plate down to a distance of 1 mm from the table. The program paused the plate for 3 seconds to allow the pasta to stick to the surfaces and then moved the plate back up at a speed of 250 mm/min. The software program recorded the force exerted on the load cell from after the pause, and on completion of the test cycle, automatically calculated the negative peak value. For each repeat of the test, both contact surfaces were cleaned and dried to ensure consistent test conditions. The graphical representation from TL-Pro, of a typical test result for each sample, is shown here (force applied, against cumulative displacement), starting from the maximum compression as the plate moves back up. 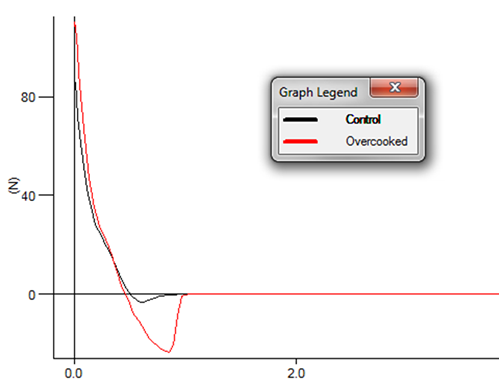 The graph shows a reducing compression force as the pasta relaxes back to shape, as the plate moves upwards. The curve crosses the X-axis as tension due to stickiness occurs and then reduces. This trough indicates the force exerted by the sticking of the pasta to the table and compression plate. The results here show that a food texture analyzer is able objectively to measure the stickiness of pasta providing confidence in the recommended cooking time. Despite the relatively small difference (approximately 4 minutes) the overcooked sample was measurably stickier than the control sample. 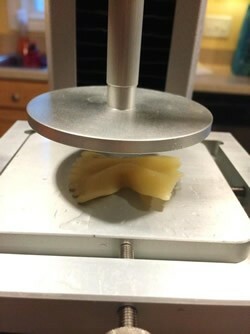 The benefits of this technique are clear, and its applicability to any shape of pasta product as a means of accurately evaluating the effect of formulation or cooking parameters, further emphasizes its suitability. The processor will now be able to make quick and reliable decisions based on objective data that has been correlated with established sensory information.